E-ZEE Supply Company is a small business concern established in 1999 specializing in top-quality, heavy-duty EZ Reachers and grabber tools of many varieties and lengths. 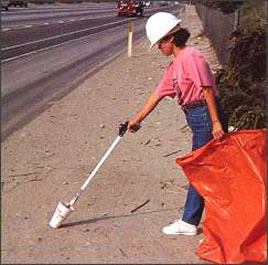 We supply litter pick-up tools to road departments, cities, beautification groups, parks, solid waste, schools, industry and public works depts. all over North America. But that's not all! Home owners will find all kinds of uses for an EZ Reacher around the home to reach items on high shelves or other inaccessable places also in the yard to pick up sticks, pine cones, rocks and trash. Our EZ Reachers are also used by many manufacturing firms for various jobs and to aid the handicapped who may be wheelchair bound or can't bend over easily. We think you will find our reasonable prices, personalized service and fast delivery make us a great place to shop! We also sell other handy products such as our fantastic all-purpose Dunn EZ Concentrated cleaner, adjustable rake, a collapsible barrel for yard trimmings or trash and a great rachet pruner. Thank you for shopping at E-ZEE Supply & Distributing Company! At E-ZEE Supply we specialize in top-quality, heavy-duty, reacher/grabber tools including the famous EZ Reacher, Trash Gator and the DOT Reacher. We carry models for all jobs, in lengths from 20 inches to 12 feet. Our products are commonly used for litter pick-up in cities and along our roads and highways. They also aid the aged or handicapped. However, that's not all as there are so many handy uses for an extended-reach grabber tool. Around the home and yard, you will find hundreds of uses for your EZ Reacher! Click "our products" here or at the top of this page, then the categories to see all we have to offer! We also sell related products and Dunn EZ, a great All-Purpose concentrated cleaner for all jobs. Click any photo to see more information and a full description of each product . E-ZEE Supply & Distributing Co. is a small business concern established for almost 20 years. We generally ship same-day and it's simple and secure to order on-line. Questions?? You can always talk to the owner, "Larry", on the phone (and you won't get a computer). We are here to answer your questions! Shipping can vary by package weight and size, the ZIP code area and/or UPS fuel adjustment charges. Oversized or multiple packages may require additional shipping cost..We will contact you if this is the case!